In the Azure classic portal, on the left navigation pane, click Active Directory. From the Directory list, select the directory for which you want to enable directory integration. To open the applications view, in the directory view, click Applications in the top menu. On the What do you want to do dialog, click Add an application from the gallery. In the search box, type Asset Bank. In the results pane, select Asset Bank, and then click Complete to add the application. 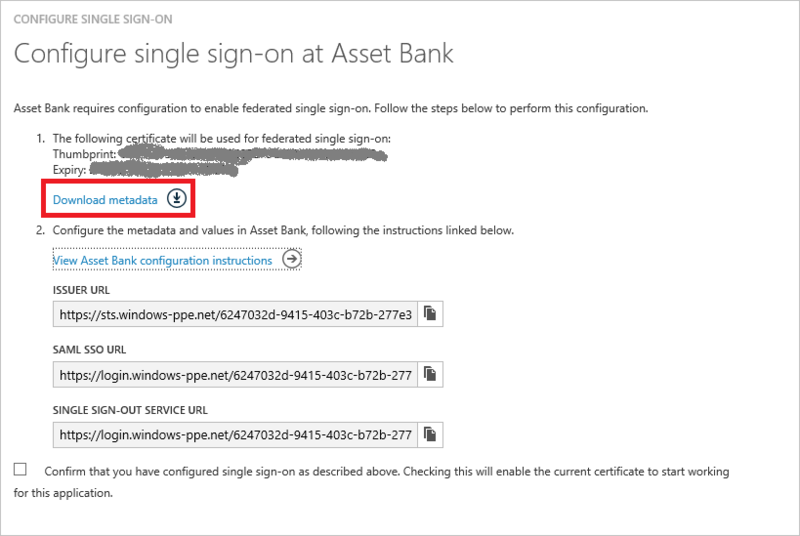 In the Azure classic portal, on the Asset Bank application integration page, click Configure single sign-on to open the Configure Single Sign-On dialog. On the How would you like users to sign on to Asset Bank page, select Azure AD Single Sign-On, and then click Next. On the Configure single sign-on at Asset Bank page, click Download metadata, and then save the file on your computer. Select the single sign-on configuration confirmation, and then click Next. Send the metadata file to our support team in you are hosted with us. Alternatively, if you manage your own server, please get in touch with our support team to receive further instructions. 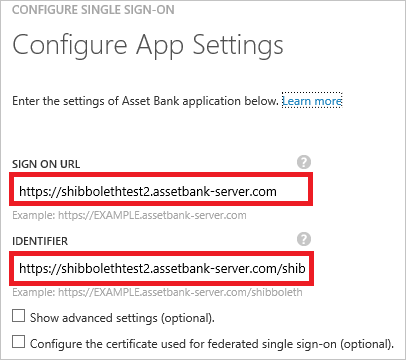 You can configure your Asset Bank to automatically assign users to certain group(s) based on the Azure AD group(s) they are in, see this article for more details. When authenticating a user, Azure AD will provide the user groups IDs rather than their names therefore you would need to retrieve such IDs from your directory in order to complete the mapping in Asset Bank. 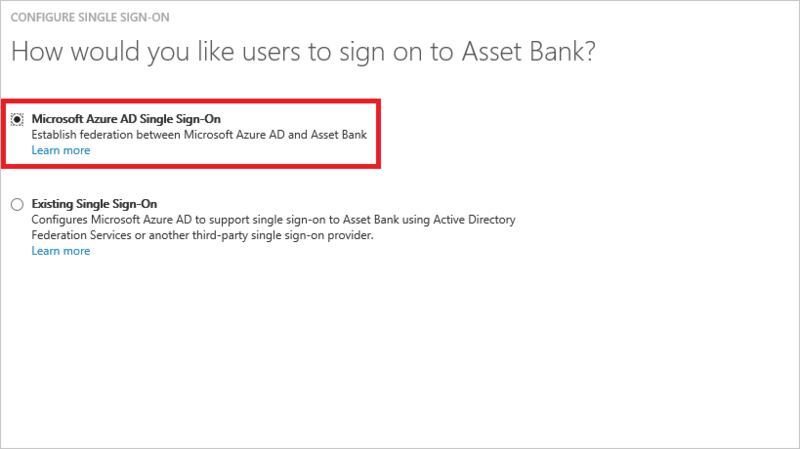 Users will be able to sign-on with their Azure AD account from the Asset Bank login page.